We’ve looked at the growth of storage and the growth of CPU core count, now let us look at RAM – the intermediary between the processor and the permanent storage. Sometimes we feel that makers are trying to pull the wool over our eyes. With storage especially few mention if it’s eMMC or UFC and that makes a huge difference in speed. Similarly for RAM there’s rarely mention whether it’s LPDDR4 or not, how many channels and so on. Instead, almost every time phone RAM is mentioned it is to boast about its capacity (or avoid the topic altogether, we're looking at you, Apple). So, let’s give in – let’s look at RAM capacity and nothing else. We’ve plotted the average RAM capacity of phones but also the maximum capacity for each year. Note that we filtered out rare phones that would just skew the statistics. The average capacity is growing – and not just that, the growth is accelerating. 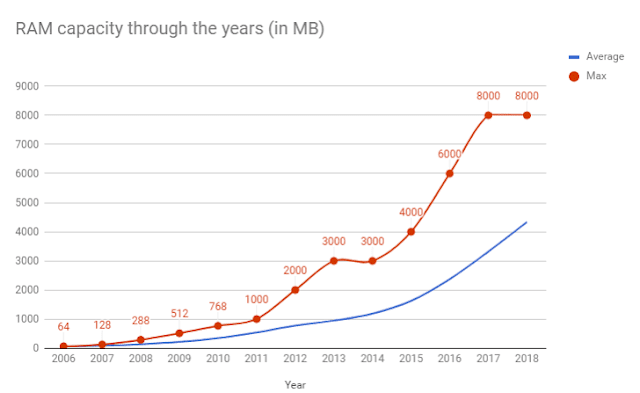 And you can see that around 2015 RAM capacity became the battlefield of a numbers war with makers trying to outdo each other, which lead to a couple of 2 GB leaps. Does this chart mean that RAM will grow forever? Well, no. It’s no fluke that the 2017 and 2018 maximums are equal. True, this year isn’t even halfway over yet, but there are other reasons. Modern flagships, the ones likely to have the most RAM, use LPDDR4 (or the 4X upgrade). The standard doubled the capacity over version 3 and enabled 8 gigabit chips – that’s 1 GB per chip. Capacities higher than that are typically achieved by stacking several chips inside a single package. No RAM manufacturer currently produces LPDDR4 in higher than 8 GB capacity, so that’s as much as phones are going to get for a while. This year’s flagships are launching with the improved LPDDR4X standard – it uses less power and has higher bandwidth, but capacity limits are the same. Samsung and SK Hynix only started producing LPDDR4X chips in 2017, so don’t expect version 5 to come any time soon. Plus, the Snapdragon 845 tops out at 8 GB of RAM. PS. laptops are having a similar issue too, but that’s largely dictated by Intel – most mobile Intels do not support more than 16 GB of RAM. But that’s just so that you would pay extra for mobile Xeons.